DSC_5216-Edit, originally uploaded by Midnight Matinee 24. It was as flawless an exhibition of Derby as one could see as Rideau Valley’s Slaughter Daughters came to town to visit the GTA Rollergirls Derby Debutantes. In a pre-season match at Ted Reeve Arena’s Bubble the Slaughter Daughters executed their plays with precision in a very spirited affair that was not sans spills and huge hits that could be expected in any match against Rideau Valley. The Slaughter Daughters are a large component of the Vixens team from Quad City Chaos 2011 and together just as the Slaughter Daughters were even more unified and brought in what they had learned going against the likes of the boisterous Tri-City Thunder, speedy CN Power and the mighty undefeated [at the Quad City Chaos 2011 tourney] New Skids on the Block. Debutantes Captain Splat Benatar and the rest of the Debutantes knew they were facing a formidable team and task. “We knew going in that this game was going to be a big challenge for the Derby Debs but we took it on as a learning experience to gear us up for our new season. Our 2011 Debs are a mixture of third season vets with last year’s Chrome Mollys making up the roster. The Slaughter Daughters are a very experienced team. They gel well together to control our pack and jammers. We can also learn a great deal from their wall breaking skills. They kept us apart from the start of the first whistle so our Debs could not get organized enough to put up a defense. In the deep cold freeze of the Bubble which made for a difficult to stop surface, the Debutantes learned their lessons well. 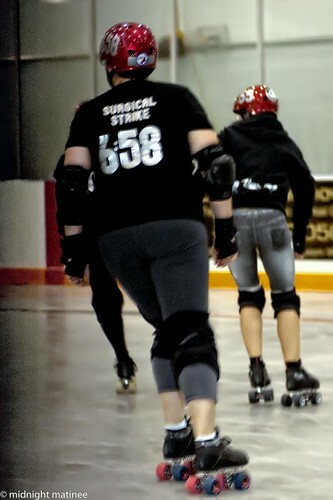 Afterwards, their self-analysis was thorough [and totally off the record] as they noted the actions and hits of the likes of #658 Surgical Strike, 10KT Semi-Precious, speedy and hard to knock down jammers 55 Soul Rekker [who did not enter into the second half] and 74 DDT. Seeing Sister Disaster on the line. Trying to avoid Drunky Brewster and finding oneself instead against walls of black of the likes of Surgical Strike and Assassinsta. The Debs were not without their own highlights. Canadian Psycho’s 17points and a jam of amazing endurance that drew kudos even from the Slaughter Daughters, Getcha Kicks sailing into the air, Tyrannosaurus Rexy gaining lead status twice, Brickhouse Bardot being thrown in as jammer along with Gypsy into the mix. As noted on one of their comments, the Debs were well deserving of every one of their 28 points they earned on the track. Although it was the major one-sided victory for the Slaughter Daughters on the track, it was all one big happy danceoff at the afterparty at Prohibition. 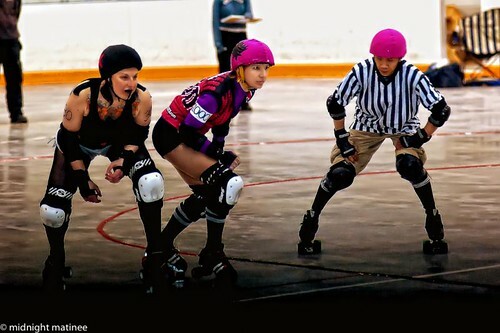 This coming Saturday the feisty and speedy La Racaille from Montreal Roller Derby come to meet the Debs at Ted Reeve Arena for Social Class Clash. 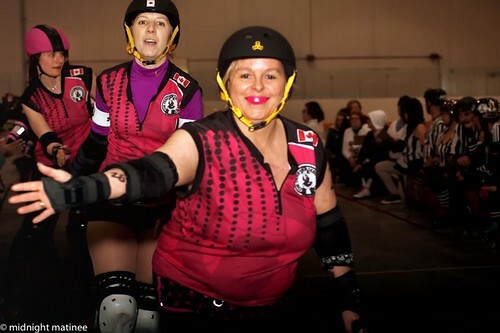 La Racaille’s roster has changed from last year with the loss of members to New Skids on the Block and other stories, but they could still bring the likes of captain and former Skids Wrath Poutine along with K-Dawg, Izzy Skellington or Squarrior just to name a few. W hile the New Skids On The Block partake in Anarchy in the UK over in London, England, and Terminal City engage in their doubleheader on the West Coast and the Tank’er Girls of Edmonton go into Prince George against the Rated PG RollerGirls, three events happen concurrently in the GTA region and just beyond up in Tri-City, none of which should be missed and puts one particular fan in a quandry. 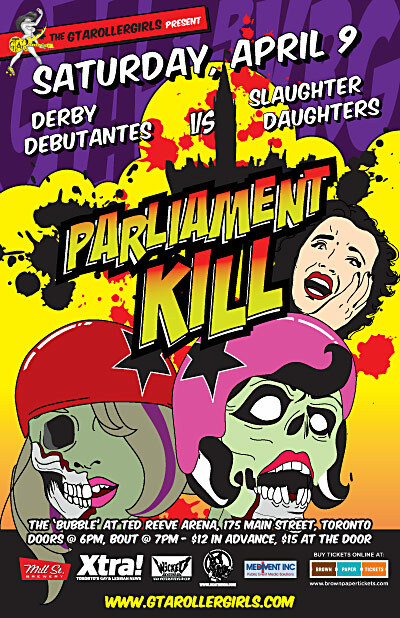 GTAR launch their pre-season or season with Parliament Kill, the 2011 debut of Derby Debutantes vs. Slaughter Daughters of Rideau Valley. This match postponed last week is back on at Ted Reeve Arena’s Bubble featuring a new edition of Debutantes looking to showcase their blend of new and veteran talent against the Slaughter Daughters, many of whom were on the Vixens squad at Quad City Chaos 2011 barely two weeks ago. Match time 7 p.m. Doors open at 6. 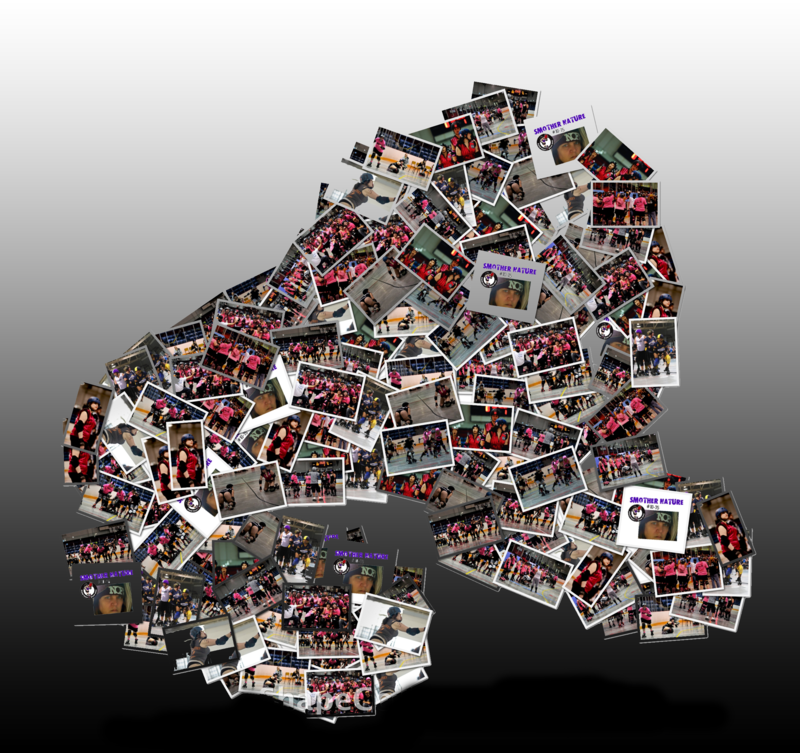 GTAR will have no time to rest because La Racaille come into Ted Reeve on April 16th. 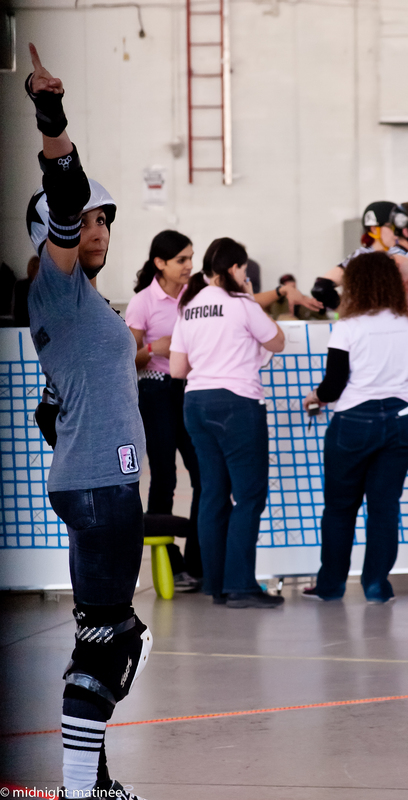 At The Hangar is a reprise of the ToRD championship teams between Chicks Ahoy! looking to get even with the Gore Gore Rollergirls. Doors at 6:30, match starts at 7:30. 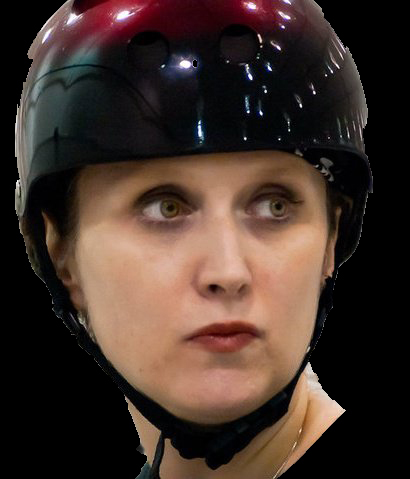 After being rejected by the Tramps on April 1, Lippy says the Tramps are going down down down when the Vicious Dishes and Venus Fly Tramps launch the TCRG season in New Hamburg. Start time 6 p.m.
On Sunday Tri-City’s new team the TKO’s will play an exhibition amongst the teams of Royal City at “Purple Reign” in Fergus. What Derby shirt are you wearing this weekend? Come watch the Greater Toronto Area Rollergirls’ team, the Derby Debutantes in their first ROLLER DERBY bout of the season against the Slaughter Daughters of Rideau Valley Roller Girls. This event will be held in the Bubble next to Ted Reeve Arena. Doors open at 6pm. Bout starts at 7pm. Gore Gore Roller Girls vs. Chicks Ahoy! 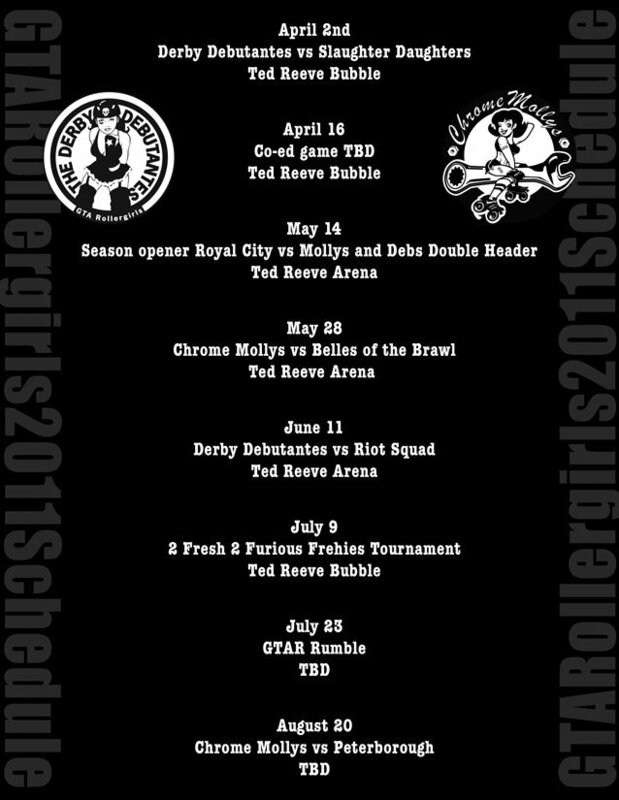 the release of the new home date schedule of GTA Rollergirls, it appears the long treks to Ottawa by their two teams last year have paid off and been reciprocated this year with both squads from WFTDA Apprentice league Rideau Valley Roller Girls teams – Slaughter Daughters and Riot Squad – coming down to GTAR this year to rumble against the Derby Debutantes. who wears the distinctive red helmet and 27 is also excited about taking on RVRG. The Trillium Rollergirls, an assemblage of seven GTA Rollergirls’ travel team infused themselves with seven members of Rideau Valley’s Slaughter Daughters to take on the Green Mountain Derby Dames of Vermont on September 25, 2010. This was not the first time the players of GTA had encountered Green Mountain before as the Derby Debutantes lost on Green Mountain’s home turf and Rideau Valley had bouted Green Mountain at Beast of the East 2009 to a close 136-131 victory. This time would be different as GTA after having been slaughtered on an away game up to Rideau Valley invited players from RVRG such as Semi Precious and ASSASSINista to participate against GMDD. This assembled squad of Team Triillum took on an mixed squad of Green Mountain A and B to the tune of 111-50. An interesting sidenote to the game was Green Mountain’s WFTDA status along with RVRG’s own application to WFTDA in the works. Half of the Canadian contingent was comprised of RVRG’s Semi Precious, Assassinista, Ripper A Part, Brickfist at Tuffyknees, Mudblood, Cupcake Killah and Smother Nature. 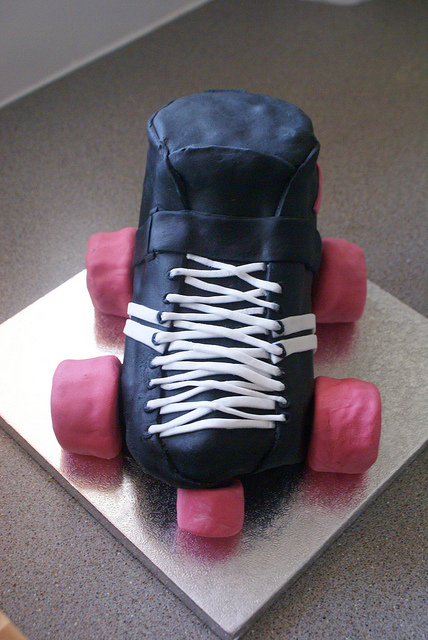 The rest of the roster rolling down in the GTAR Derbymobile were GTAR’s Newfie Bullet, Pinky Tuffadero, Canadian Psycho, Lee Way Wreck’em, Getcha Kicks, Bruise Berry Pie and The Krow. On The Road shenanigans in corn mazes and did you say goats? The goats were not only on the track but by the corn maze to be petted. Any other hijinx before and after winning the after-party which ensued have all been plausibly denied. More details will be dug out.